This page features a growing collection of Easy Homemade Gift Ideas for originally designed, free printable crafts, games and classy-yet-inexpensive gifts. EVERY BODY, EVERY WEAR (The Illustrated Glossary of Fabric, Fasion and Style) is a glossy, informative, fun new ebook is recommended at fashion colleges all over America. ABODE The Picture Dictionary of Home Construction and Residential Architecture. Best bargain on Amazon for this type of book. SAN FRANCISCO EASY STREETS is a hand digitized neighborhood map atlas containing eight original maps and a visual street index with more than 200 recent, original, unpublished (until now) photos. FREE FASHION DESIGNS This page offers a simple selection of popular fashion patterns for cute, stylish ladies' garments. Easily and quickly create your own summer dress or summer top. Or easily create these things for someone else. Designs and EASY instructions are provided. 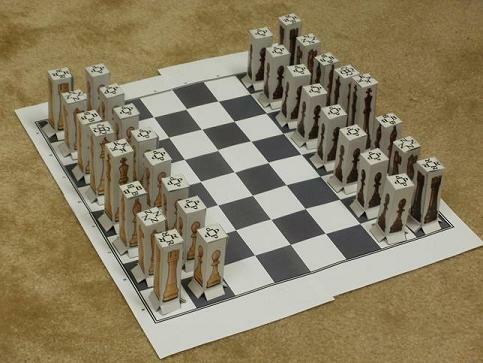 FREE PRINTABLE 3D CHESS SET Seriously, this chess set is the best design on the market, only it's not on the market because it is free. Follow the EASY instructions to print and construct a well working chess set featuring attractive, full sized pieces and a board printed with algebraic notation. FREE EASY HOMEMADE GIFT IDEAS FOR EASTER This page features many cool holiday suggestions for themed Easter basket creations. Photos and extremely simple instructions are provided. HOMEMADE HALLOWEEN COSTUME IDEAS Stop spending fifty or a hundred bucks on cheaply made mass produced Halloween wear. You can eaily create your own very cool, very clever Halloween costumes. When it comes to being creative, it really is the thought that counts. FREE CUSTOMIZABLE CALENDARS Download your own monthly calendar blanks, then fill them in with the designs of your choosing. Then print them out for someone special (like you, for instance). FREE GOURMET RECIPES A broad variety of delicious, inexpensive, easily prepared recipes for breakfasts, lunches, appetizers, dinners, desserts and special occasions. Print and compile your own cookbook. Or just make a splendid meal for the one(s) you love. Finally, a customizable, FREE PRINTABLE TAROT DECK is among the most popular easy homemade gift ideas. Look here for Free Printable Sheet Music.